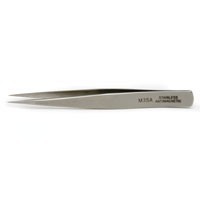 Dumont Dumoxel Tweezers are made of patented Dumont steel. They are resistant to staining, but slightly softer and less magnetic than stainless steel. Dumoxel has a higher resistance to corrosion due to its high content of molybdenum and chromium. It is very resistant to sulfuric acid, hydrochloric acid and other mineral and organic acids. It is autoclavable, and it is more likely to bend than to break.